Bet on the Mega Millions Jackpot from the UK! The Mega Millions lottery has new rules! As of October 28, 2017 there is now a real possibility of a billion dollar Mega Millions jackpot. Place your bet on the results from the UK only at Lottoland! The draw takes place in Atlanta, Georgia at 11pm on Tuesday and Friday evenings. That equates to approximately 4am on Wednesday and Saturday mornings in the UK. The largest Mega Millions jackpot occurred on 30thMarch 2012, hitting &dollar;656 million. 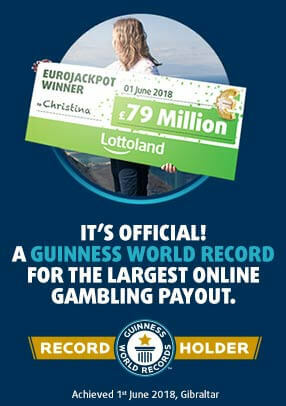 At the time it was the biggest jackpot offered in history. It’s since been trumped by Powerball’s record &dollar;1.6 billion jackpot on the 13th January 2016. Tier 1 winning bets on MegaMillions are paid out as 30 year annuity or discounted lump sum at Lottoland’s election, and Tiers 1 – 3 also subject to 38% reduction as per T&C's. For just £1 extra you can select the MegaPlier option for the chance to boost all non-jackpot prize tier winnings by up to x5.